You should have a link to all of your character profiles in your signature. It makes it easy for others you are in threads with to find your characters. The exact design is up to you, but follow these steps to get started. Copy the link to your approved character from your URL bar. Locate the Profile button in the bar along the top of the webpage. It looks like this. 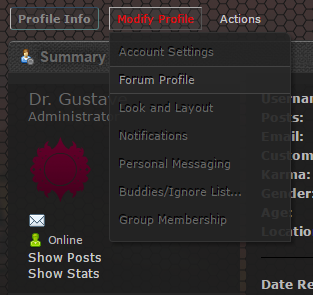 Hover over "Modify Profile" and select "Forum Profile" from the drop-down menu. It will look like this. In the signature box at the bottom of this page, type in the following, substituting my character link and name for yours. Like this. Hit change profile. All done! Once you submit your character, they require two approvals from staff, or certain members. You can read more about this process by clicking here. Read all the steps! There's like, four. Post in this thread with a link to your character profile. A copy of the character will be made in the profile, and then the profile will be moved to this board. Make your edits. Once finished, post in your character profile and describe the changes you made as best you can. Please be descriptive so we can quickly check the changes and move the character back. If you do not post and let us know you edited your character, we won't know you edited it. The profile will be looked over and moved back to the Approved section. If there are major changes that require further review, we will discuss it with you. Infusion: Infusion is the archaic and highly dangerous system of utilizing Dust in combat. One can infuse Dust with their clothing, or even directly to their skin in order to gain the benefits of it. This is a wildly dangerous and painful practice that, while not outlawed, is very rarely practiced. The advent of technology has allowed for safer applications of Dust in combat while maintaining the same firepower, or in many cases increasing it. As such, the benefits of infusion do not outweigh the disadvantages. Infused dust is known to spontaneously combust if hit without aura shielding, inflicting significant damage or death to the person wearing it. Infusion also does not grant abilities/attacks that technology cannot already create. If your character infuses Dust, you need to very clearly explain why they do it, why they don't use technology(which is safer and more powerful) and how they are still alive. We also have passive variants of infusions call "Glamour." Glamour can be infused into clothing to create passive effects ranging from using fire dust to keep clothing warm in cold weather or using ice dust to keep cool in the summer to using dust in clothing to create a sparkling fashion effect. Glamour is somewhat pricey and must be replenished though, so keep that in mind when making a character. 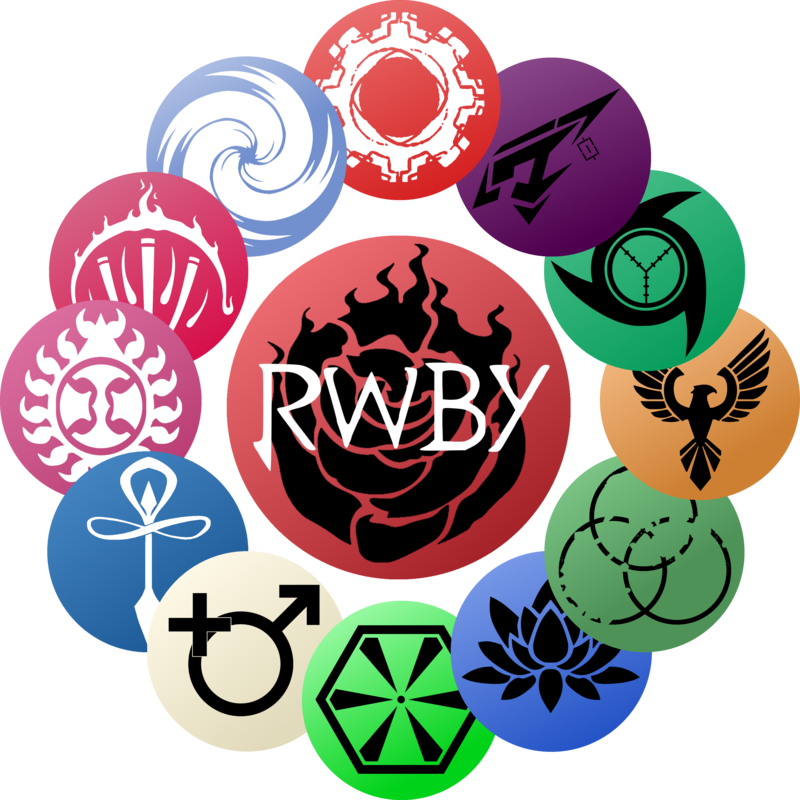 Think about it like this, will the end result of your thread/plot affect people or things outside of the people within the plot? For example, if there were to be a thread where the white fang bombed a bank, but were stopped by some characters, other people would probably know of it but wouldn't be effected by it. On the other hand, if they succeeded, a bank just got blown up. That's a big deal. You should contact a staff member. 9/10 times we're going to approve, but just in case of that 1/10 thread, this system is important. Mary Sue/Gary Stu are names used to describe characters that are cheating in some way. The most common way is when a character is capable of avoiding danger when they realistically shouldn’t be, or can surpass other limits not normally possible. They may have plot armor, which is not allowed here. They Godmodding is the act of controlling a character who exhibits these traits. Expy Character is short for Exported character. An expy is a character who may have a few altered traits, usually minor, but is otherwise a copy of a character from another series. Basing characters loosely off another character or series can be acceptable, but when the characters are so close that reading one makes you instantly think of the other, they are likely too similar. Nope. The hierarchy of accepting things as canon goes show first, secondary sources... second. The game implicitly contradicts the show with Merlot. Atlas is supposed to be the pinnacle of technology, they just released a clunky-ish line of robos to replace clunkier older ones. Meanwhile, Merlot made ninja flipping combat robos all alone. this also means that the mutant Grimm he makes are non-canon. The manga is mostly non-canon. It has been shown to contradict the show, Weiss fights a possession-type Grimm that was an amalgam of different Grimm made by the SDC in the manga but the armored suit was confirmed to be the Arma Gigas form of the Geist in the show, however, what does contradict is fairly limited in scope. This means stuff like the new Grimm shown in the manga is canon. This is, for all intents and purposes, a near complete AU. Only things sticking around are the setting and large enough or small enough companies like the SDC and From Dust Till Dawn respectively. We have some differences in the setting, however, stemming from staff worldbuilding during the great information drought of Volume 1, 2, and some of 3. The fanon WB info can be found in the WB section.